For many of us melted butter is not an exotic, but a completely everyday product. It can often be found in the kitchen of caring housewives. But do you know about the very special oil ghee? Since ancient times for the people of India it is not only the main ingredient of national dishes, but also an effective medicine with multilateral actions! And some sacred rituals are still held with the participation of this fragrant component. What is ghee and what is it eaten with? 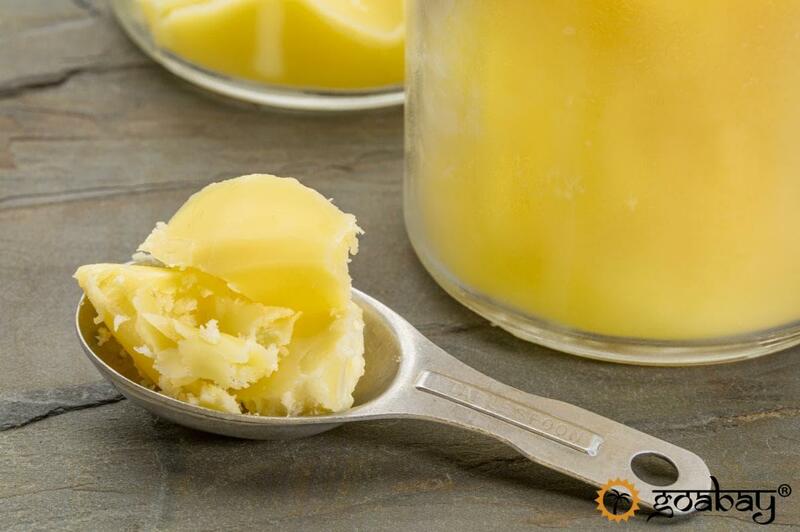 Ghee is a sun-golden oil with a pleasant aroma and unique flavour. It is obtained by long heat treatment of high-quality cream. In the ancient texts of Ayurveda you will find laudatory odes to this product. Historical notes compare it with “liquid gold”, including in the infinite treasures of the rulers and mentioning it as a valuable gift for respected people. From generation to generation pots of Ghee were handed over: it went into action in the kitchen, and to treat ailments, and to strengthen the body of children and the elderly, the beauties prolonged their youth with it, and refurbished the lamps, and offered it to the gods! Nowadays ghee oil can be found on the shelf of even the most extraordinary shop in an Indian village. But especially appreciated oil prepared according to all traditions. It’s hard to compare Ghee with regular melted butter. Hence the unique properties of the product. For the production of one litre of oil one and a half litres of selected cream is usually used, which are whipped to a creamy state. For a long time over low heat all the water and unwanted dairy products are melted from the obtained raw materials – this is how casein (milk protein) and lactose are removed. If the oil is prepared in the temple or by the senior members of the family, then during the whole process mantras are read over it. Indians believe that the atmosphere in the kitchen is as important as the quality of the original products. The finished little is poured into ceramic pots, it is closed with gauze and after that, it can be stored for dozens (!) years without a refrigerator even in a hot summer. It is believed that Ghee can “ripen” like a good wine. At the same time it changes color and even taste, and its unique healing properties only increase. How to use: health benefits. Season the basmati pearl rice with ghee oil, add a bit of saffron and you will get the dish that was served to the rulers of India! Without unique melted butter it is not possible to cook traditional sweets and scones; the taste of vegetable sabji or curry will be quite different without a spoon of ghee; samosas will not come out so crispy. You can fry foods on ghee without worrying about the threat of carcinogens – the oil doesn’t boil, doesn’t foam and doesn’t burn. This product is suitable for diabetics and for those, who suffer from lactose intolerance. In Ayurveda Ghee is used so actively that on a level with Triphala it is included in the “golden” composition of the main recipes. Oil is valued for its unique warming, regenerating, antioxidant properties. It is used alone and in combination with herbs, spices, minerals; Ayurvedic tablets and jams are made on its basis. As a preventive measure against rickets, tuberculosis, atherosclerosis, arthritis and osteoarthritis, simply enter Ghee in your diet. Even the risk of cancer is reduced. Oil has a very beneficial effect on the digestive system: protection for the intestines and internal organs. In a period of particular vulnerability to colds you can lubricate the nose and throat – good protection of germs. And if you still get sick, then by mixing a teaspoon of ghee with black pepper you will get amazing cough medicine. One of the ways to strengthen the body at all levels Ayurveda considers massage. 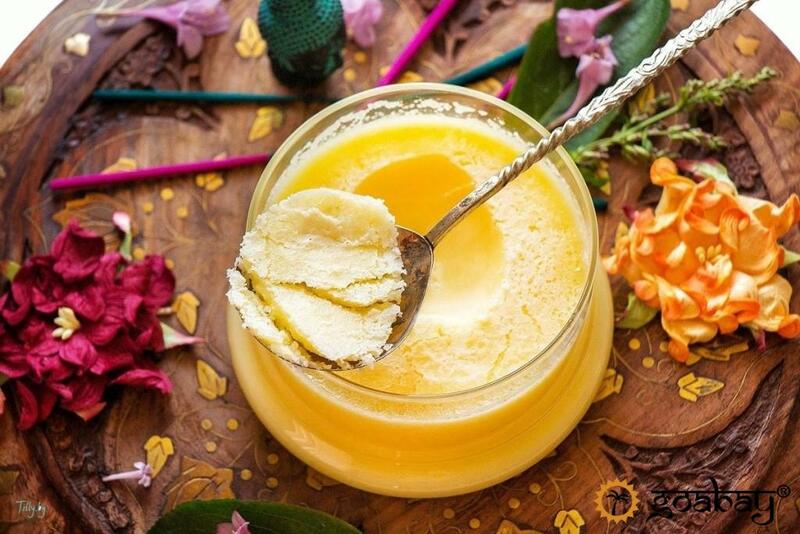 Therefore it is not possible to imagine the traditional procedure of cleansing and rejuvenation of the body -Panchakarma – without Ghee: it penetrates deep into tissues, warms the muscles, maintains skin elasticity. It is possible to secure joints and ligaments by regularly rubbing ghee – this is one of the secrets of wise yogis! This unique product fits all three doshas. Suffering from insomnia? Drink warm milk at night with a spoonful of ghee. Want to clean the intestines? 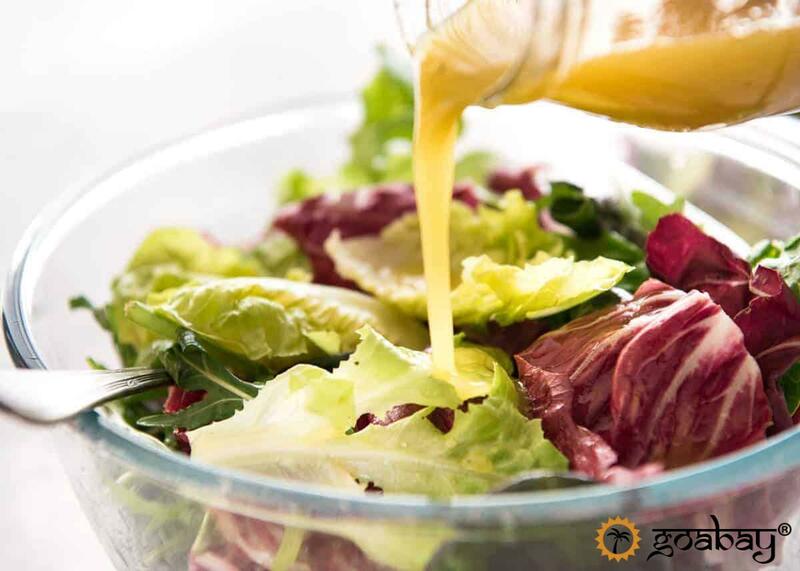 In the morning eat a small amount of melted butter and drink down with warm water. After the massage with Ghee, the skin becomes soft, velvety. Also on its basis you can create masks, creams and lotions with essential oils at home. One of the most pleasant features of this amazing product is that if you have inspiration and patience, you can cook it yourself – there are many recipes on the Internet. If you want to touch the original then simply order Ghee in our online-store with delivery from India. Discover something new for yourself with GoaBay! Categories: Ayurveda, Drops , Oils. Tags: ayurveda, ayurvedic, for health, for kids, for men, for skin, for women, for yoga, ghee, Oil, для кожи, масло. Patanjali Cow ghee is full of nutritive properties and an ideal diet. 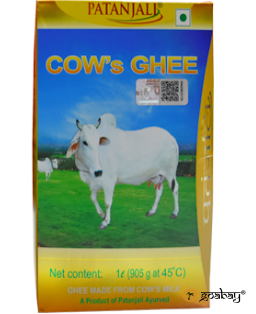 Cow ghee increases memory, intellect, the power of digestion, Ojas, Kapha and fat. Regular consumption of ghee or inclusion of ghee as part of the diet is recommended for those seeking weight gain. Milk fat from cow’s milk. This entry was posted in Health and beauty, Сookery. Bookmark the permalink.